I spotted this one on the new book shelf and at first didn't really get the title. Then when I took it home and read it, I totally got the title! Guyku by Bob Raczka is a set of haiku written about things that guys like to do, divided by seasons. It's illustrated by Peter H. Reynolds and will be loads of fun for the boys in my library. Here are some examples. What great examples of haiku that boys will completely relate to and hopefully it will encourage them to try some of their own. Score another find on the new book shelf at my local library in Hilliard! By the way, I hope all of you Central Ohio friends will support the Columbus Metro Library when you vote on November 2. We are so fortunate to have this great resource, voted number one in the nation, AGAIN, even with their budget cuts and we need to support them. My name is Bill Prosser and I approve this commercial. Now on with my review! 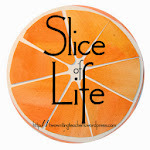 Lisa Graff writes great stuff for older elementary kids, The Thing About Georgie and The Life and Crimes of Bernetta Wallflower are two of my favorites. I was thrilled to see that she has now written something for earlier readers, I'm thinking late second and third graders, and just like her other stuff, Sophie Simon Solves Them All is good! Sophie Simon is a child genius, she can't be bothered with everyday kid things like third grade, friends, birthday parties and the like. She's so smart that she could say the alphabet backwards and forwards at age two, the Russian alphabet. She performed open heart surgery on a worm at the age of seven, all five of the worm's hearts! and the list of accomplishments goes on an on. Her parents, on the other hand, get all of their parenting advice from a doctor on TV who encourages parents to not push their children, let them grow up "well adjusted." Imagine the horror when they discover a college calculus book in Sophie's backpack! They are appalled that their child may not be growing up "well adjusted." The parents are too funny with all of their little pet names for Sophie, all of them food items like wonton, apple crisp, lemon wedge, gum drop, each one funnier than the next. As the story goes on we find out that all Sophie really wants is a graphing calculator, and we meet her classmates. Owen Wuu who likes things quiet and orderly but his mother is overbearing and boisterous and always does the opposite of what Owen wants. Daisy Pete who is constantly tripping over her own feet but is forced to take ballet lessons by her parents the pet store owners. Julia McGreevy who aspires to be a journalist even though her math professor father wants her to be a mathlete and compete in problem solving competitions. All four third graders have problems with their parents and all of them have thoughts that maybe they had been switched at birth. They all come together in sort of a perfect storm kind of way with their issues. 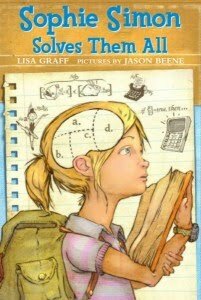 Sophie, as the smartest person they all know, finds herself at the center of the storm and figures out the solution to all of their problems. In the end, Sophie ends up with friends, something she doesn't quite know what to do with. It's fun story with twists and turns and humorous interactions. I'll be anxious to see what my younger readers think of it. Nonfiction Monday - great Cybils finds + one more! Last weekend, was the huge Junior Library Guild warehouse sale here in our neck of the woods. Every book cost only $5!! The warehouse was packed with not only books, but librarians and teachers. It was great sport just to watch everyone try to wheel their massive amount of purchases up and down each aisle. But, this year, I was a little more focused with my own buying. 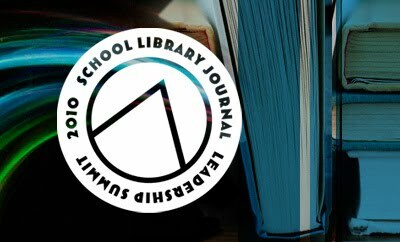 Since I am on the Cybils Nonfiction Picture Book Panel, and I know that is harder to get publishers to send copies to the panel due to economics, I was looking for some of the books on my category's nomination list. I found three that look very interesting, and then I fell in love with one other but I don't think it is on our list. P op! The Invention of Bubble Gum by Meghan McCarthy -- Even the front cover makes you want to open it; great colors! As I read it, I actually wished I had owned this book two years ago when one of my students, who loved to chew bubble gum, decided to do research on it. This book would have been perfect for her! Factual text backed up by fun, kid-friendly pictures make this book a good fit for a classroom library! Stand Straight, Ella Kate: The True Story of a Real Giant by Kate Klise and M. Sar ah Klise --I was hooked by the title and knowing the Klise sisters were at it again! This is a great book about a fascinating woman who led a very full life. A wonderful example of a biography for students, and I really liked that the whole story is told in first person. The Extraordinary Mark Twain (According to Susy) by Barbara Kerley and illustrated by Edwin Fotheringham: This story is told from Susy's (Mark Twain's daughter) viewpoint. It has a very unique layout -- quite a few times in the book, a journal has been inserted with actual words from the actual Susy. I am fascinated by how difficult those smaller journal pages that flip open must have made actually publishing this book. Kerley is such a reliable author, and once agian, Fotheringham's pictures delight -- they make an excellent team! The final book I found at the JLG Warehouse sale was The Circulatory Story by Mary K. Corcoran and illustrated by Jef Czekaj. I loved the illustrations from the beginning - th ey made me chuckle, even while learning. When I realized Czekaj had illustrated Unite or Die: How Thirteen States Became a Nation, I realized why his style looked so familiar. This book shares how our ciruclatory system works with great illustrations and wonderful analogies that students will understand. I will definitely be using this text with my 5th graders this year when we study the circulatory in health. It's the best text I've ever seen to help students comprehend what could be a very difficult topic. As you can tell, it was a great day at the Junior Library Guild sale -- I walked away with some great nonfiction titles to share with my class. What makes it even better is that I feel fairly certain that these are the types of titles that will fly off the shelf once they are introduce d.
For more great nonfiction ideas, check out the Nonfiction Monday roundup at Write About Now. To see where the roundup will be each week, check the master list. A while back I heard from my friend Franki at A Year of Reading that she was going to attend the School Library Journal Leadership Summit in Chicago. 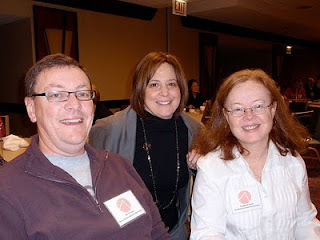 She thought I should too, so, along with our fellow Dublin librarian, Beth, we flew to Chicago for the two day event. Adventures were had by all, Beth and I hadn't flown in some time and it took all three of us to navigate the train from Midway to downtown, especially since Franki brought along a suitcase full of books for her next stop, a presentation in Hershey on Sunday. The theme of the conference of this year was The Future of Reading, which is a little confusing since most of what we discussed is already here and we may already be behind. Such is the world of technology, by the time I make a decision on the direction I should take, I'm too late and the moment has passed me by. The presenters each had between 15 and 20 minutes and a lot of information went into my brain, in fact, I had to get up and walk around several times to try to process some of the ideas that had my head spinning with questions. All in all it was a productive weekend, the second day better than the first, the three of us from Dublin decided we had enough to talk about and keep us busy for a while. What follows is a list of questions and observations from my days in Chicago. Should we really be investing much into eReaders like Kindles and Nooks, or are they just a transition that may be obsolete in a few years when something far better comes along? Would our students be better served if we went to more up to date data bases and electronic versions of non-fiction books? How does Franki keep track of all of that information on her iPad and iPhone and listen to the speakers!? It's interesting how defensive advocates of electronic books are when someone mentions that they really enjoy the feel and smell of an "old fashioned" bound paper book. It was interesting that the youngest among us, the high school student panel, had not switched over to the eReader yet and weren't sure it would serve their needs. A couple even mentioned that they liked the feel of an "old fashioned" bound paper book. I agree with illustrator Paul Zelinsky that there is something about the art of a picture book that will be lost if the whole thing goes electronic. I also agree with Paul Zelinsky when he thinks that physically turning the pages of a picture book is part of the experience that young readers like. Finally, being with a bunch of librarians in a room for two days is an interesting experience...'nuff said! I reviewed Touch Blue by Cynthia Lord this summer and absolutely fell in love with the story, the setting, and the characters. A friend of mine from my former school left the comme nt that Touch Blue sounded like a perfect book for a Grand Discussion (a parent-student book talk). She and Bill (my blog partner here at Literate Lives) have been doing this for several years with great success. Since being at my new building, the school librarian and I decided to set up similar student-parent conversations of our own called GREat Discussions (see how I know a good idea when I hear it? Thanks Bill and Joyce!). Anyway, back to my point. Tonight was our first GREat Discussion of the year, and we chose Touch Blue as the book to discuss. Cathy (our librarian) and I brought the treats, and then waited for the people and conversation to come. We were not disappointed by either one! What transpired tonight was amazing!! We had 33 students and parents totally caught u p in all the conversations. Because of the large numbers, Cathy and I decided to pose some questions to everyone, have them talk at their tables, and then come back to the big group and share out the important thoughts and conversations. The students were eager participants from the very beginning. They really drove the conversations, but the parents became more active in the discussions by the end of the night. Such rich, rich conversations swirled around the room from person to person. We started at 7 PM and ended at 8:15 PM, but there were several parents and students who could have gone much, much longer. Parents and students sharing a reading experience together. I would bet that there was some conversation within families before we even met for the GREat Discussion. Sharing a book with others makes you appreciate it in a much more deep and meaningful way. Parents were amazed at the depth of the students' conversations. It was great for them to see what kind of conversations children can have in the presence of a wonderful book. Students got to see their parents as readers and participants in a meaningful conversation. Parents coming to us afterward to tell us how grateful they were that they to ok part in this book talk. Students and parents alike begging to know what the next book for GREat Discussion will be. Today, my husband and I followed our daughter, Carrie, around the city of Columbus, watching her and rooting for her as she ran a 26.2 mile marathon. For months before this event, I know she's been in training -- following a course of actions that would allow her to accomplish her goal of crossing the finish line. Now that I've had a few hours to celebrate her amazing feat, it made me start doing some reflection of my ow n. I made the connection that this year I'm learning with a team of colleagues in my own building, as well as colleagues across the country as we take part in the PLP (Powerful Learning Practices) activities. Because there's a plan for how we spend time learning this year, I'm engaging in a mental marathon training of my own. Just like Carrie, there have been suggested activities that will help me achieve my own learning goals by the end of this school year. Like Carrie, I can choose to follow these suggestions or I can ignore them. I think I'll be following her example and actually stick to the game plan. This month, our PLP group has been asked to utilize the web 2.0 tools that are accessible to us in a way that allows us to continue to connect, create, contribute, and collaborate with others. Training item #2 - I recently wrote about my RSS feed, and from that came a perfect example of how collaboration can happen via a blog. As I shared how far behind I am on the blogs I follow, Scott left a comment about how he is suggesting to others that they make their RSS feed their home page. Such a simple idea, but how powerful. Now, I immediately see my RSS feed when I click on Firefox, and I have been much better about reading (and even commenting) on others' blogs. So, by making my own thinking public, I learned from someone else -- a wonderful tribute to Web 2.0 tools! Training item #3 - I need to figure out how to check in on my delicious account more frequently. I've bookmarked so many great articles; I now need to find out how to go back and spend some time reading those pieces. And to add to that, our small cohort group discovered how to "friend" each other's delicious accounts, so I just recently increased my ability to access smart thinking exponentially. Now, I just need to make the time to explore all these great sites. Just three goals, but as I become more proficient at utilizing these web 2.o tools, I think it will help me get closer to the finish line for my own mental marathon with PLP this year. 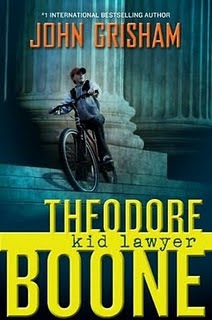 I just finished Theodore Boone: Kid Lawyer by John Grisham and I can't wait to read the next book! I was surprised when I came to the end of the book and it DIDN'T END! I wasn't able to close the case, find the bad guy guilty and cheer for Theodore Boone, Kid Lawyer! My first reaction was frustration, but then I thought how brilliant it was. Kids are definitely going to want to read the next book to find out what happens. Theodore Boone is the son of two lawyers and is in love with the law himself. He hangs around the court house and makes friends with judges, secretaries, para legals, bailiffs, court reporters, anyone who can get him inside the law and all that goes with it. In this first book, he is intrigued by the biggest case to hit Strattenburg, a murder in the gated community nearby. He talks his way into the court room and manages to get seats for his 8th grade government class field trip on the first day. As in all Grisham novels, the defendant is seen as guilty by most of the people involved with the trial, but the case is not cut and dried and it looks as if he will probably walk. Theodore watches and can't help but feel that the guy will get away with the perfect crime until a class mate from El Salvador comes to him for help in algebra and English. During the tutoring session it comes out that his cousin who is in the country illegally may have witnessed something that could have a huge impact on the murder trial. I'll stop there because I don't want to give too much away, but let's just say from that point on, I couldn't put the book down! Throughout the story, Grisham introduces side plots like Theodore's friend April who is involved in a messy custody/divorce situation. Theodore is periodically asked for legal advice from class mates including the popular cheerleader who needs help freeing her dog from the pound and the school secretary whose family member has been arrested on drunk driving charges. Obviously Theodore can't and doesn't go to any court higher than animal court, but he does dispense with some pretty good legal advice and the information he shares about our court system is well written and informative. Grisham is great at building the suspense in this book and it is very much like adult books, but written specifically for kids. I was a little suspicious when I saw that he had entered the kids book field, but I was very impressed at how the book was written clearly for kids, I'll be recommending it to my fifth graders for sure. I won't lie, I avoided this book several times when I saw it on the new book shelf at the library. I just didn't like the looks of it, yes, I'm guilty of judging this book by its cover. Not that there's anything wrong with the artwork or appearance of the cover, it just reminded me of several other books that I did read that I didn't really like, so I filed these Incorrigible Children with the others I didn't like. 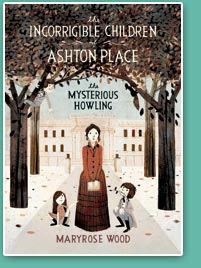 What changed my mind about reading The Incorrigible Children of Ashton Place: The Mysterious Howling is that I noticed it popping up on some Newbery watch lists. Then I was compelled to pick it up and give it a read, I'm very glad I did! Written in a smooth, calming style which almost seems almost old fashioned at times, the book slowly introduces characters and sets the Victorian scene with a very pleasant tone. The reader is drawn in by Maryrose Wood's word choices and when she hits the action packed conclusion, the cliff hanger is almost frustrating because you want more. Miss Penelope Lumley a 15 year old graduate of the Swarneburne Academy for Poor Bright Girls is hired by Fredrick and Constance Ashton to care for and educate their children. The job description is somewhat mysterious and requires someone who also can work with animals and Penelope is a perfect fit. She is governess in the likeness of Maria von Trapp and Mary Poppins who possesses maturity well beyond her 15 years thanks to her impeccable training. When she arrives at Asthon Place she is met by the other members of the staff, the coachman "enigmatic" old Timothy and the warm and helpful housekeeper Mrs. Clarke who welcomes her and helps her settle in. At the first meeting with Lady Constance, she can't help but hear a loud howling from the yard, a howling that no one wants to talk much about except to say that the hunting dogs need to be fed even though Penelope has questions about the source of the noise. Penelope signs the contract without meeting the children after speaking with the gentleman of the house, Fredrick, a strange man with strange ideas about how children should be raised and a keen interest in hunting. He also enjoys spending time at his club and is rarely home. When Penelope finally meets the children, she finds them locked in the barn, naked and huddled together like puppies in the straw, with only a blanket to cover themselves. She soon learns that Fredrick found them on one of his many hunting trips on the Ashton Place property and it is assumed that they were raised by wolves since most of their characteristics seem more wolf than human. From there on, it is Penelope's job to teach them and humanize the three children named Alexander, Beowulf, Cassiopeia by the master of Ashton place. They are later given the last name of Incorrigible because he doesn't want them to share his last name. The children make amazing progress towards their coming out at the fancy Christmas party that Lady Constance is planning, including one scene where they learn to dance the schottische. It was straight out of the Sound of Music with the three wild things dancing around the manner lead by Penelope and some of the younger members of the house staff. I don't want to spoil anything here by giving away the ending let's just say it involves some mysterious notes, hints of an unusual hunting expedition and Lord Fredrick missing the big party but showing up the next day a bit hung over and covered in scrapes and scratches. I read the book and I have so many questions that I can't wait for the next book which comes out in February. I like this book a lot and will be recommending it to my fifth graders who really enjoyed The Mysterious Benedict Society books.